Book Review: “Augustine on the Christian Life” by Gerald Bray | J.W. Wartick -"Always Have a Reason"
Gerald Bray’s Augustine on the Christian Life is written in a very different style from previous entries in the “Theologians on the Christian Life” series–at least those that I have read. It is organized around a mere five chapters, each focusing on an aspect of Augustine’s own life: life and times of Augustine, Augustine as believer, teacher, pastor, and for today. What makes the presentation so unique is that a good portion of the first few chapters follow Augustine’s own series of thoughts from pagan to Christian, derived from his Confessions. The focus on Augustine as Augustine makes the book quite readable, as it presents his theology in ways that are directly applied to the subject of each chapter. It reads as though it is the life story of Augustine, punctuated with his theological insights, which are themselves applied back onto Christian life in general. The way the book is presented, however, often means that Bray spends a significant amount of time focusing on the general theology of Augustine rather than on his specific theology of the Christian life. 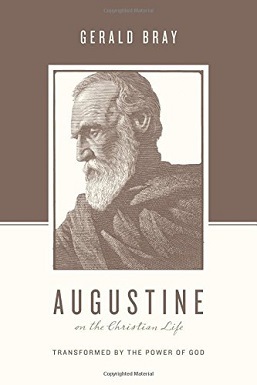 Large portions of the book are spent outlining Augustine’s theology, without any clear application to the theology of the Christian life. Thus, there is lengthy discussion over predestination, original sin, and the like. Each gets developed in great detail, with Augustine’s thoughts laced throughout. Each is also related back to Augustine’s own life and shows how his thought was developing over time. A good portion of the book is also spent showing Augustine’s specific exegesis of various passages, and how his holistic view of Scripture allowed him to make good points despite having often subpar manuscripts with which to work. These sections are intriguing, because they introduce readers to Augustine’s hermeneutics as specific passages demonstrate the care with which he worked with the text. Moreover, Bray notes that the influence of the allegorical method upon Augustine can be overstated, and that the method itself should not be completely ignored when it comes to reading the Bible. The final chapter, “Augustine for Today” does much to draw all the threads together into a coherent picture of Augustine’s theology of the Christian life. Indeed, the last chapter is the one that is most similar to other books in the series. Yet it is built upon the foundation of the previous chapters, turning the work into a kind of biographical, narrative theology similar to Augustine’s Confessions themselves. It is an intriguing way to have written the book. Readers may have to work harder to gain the specific insights on the Christian life from within the book, but doing so is a pleasurable journey into the mind and heart of one of Christianity’s most important thinkers. It is as though readers are discovering the hows and whys of the Christian life right alongside Augustine, and exploring the same issues he has in drawing out the faith. Augustine on the Christian Life is a fresh read that provides readers with insight into the whole of Augustine’s theology. Its style is different from other books in the series, but the presentation is interesting and accessible. It is well worth the time spent reading it. Gerald Bray, Augustine on the Christian Life (Wheaton, IL: Crossway, 2015). As always, a great book review. It sounds like perhaps this volume is aimed more at those unfamiliar with Augustine, who’ve never read “Confessions” or studied his thought before. I can easily imagine someone hearing Augustine mentioned in the context of one of those “hot button” loci you mentioned – original sin, predestination – and wanting to go find out how just who he is. Sounds like it might be a good refresher volume for folks like me, too! Thanks for bringing it to our attention.